Building 173: Remnants of a Vanishing Shanghai (Enhanced DVD) is an intriguing tale about one of Shanghai's downtown high rises and the interesting motley of individuals who inhabit the structure. Building 173 in downtown Shanghai is a high rise apartment complex that embodies the bold changes China has experienced over the past 75 years. Once a bustling port, the City of Shanghai is no longer as relevant as it was in the past. 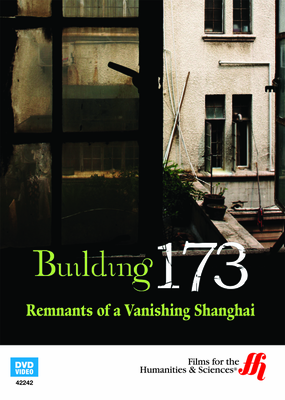 By observing the history of building 173, viewers can get a more in-depth understanding of one of the world's most historic cities. The enhanced DVD details the lives of several residents in the building, including a highly-educated diplomat and a member of the Red Guard. The live action footage is gripping and its' accompanied by animated footage that helps to narrate the story. Remnants of a vanishing Shanghai takes viewers into a world where ancient traditions are being infringed upon by modern demand. China is experiencing an industrial boom which is largely responsible for the vanishing of cities like Shanghai. This DVD teaches the importance of balancing modern progression with historical relevance. The story is told from the perspective of several different people, allowing the watcher to see how the changes in shanghai are positively and negatively effecting the citizens. The lessons within can be used as guidelines to aid developing nations in the future as they turn to industrialism.